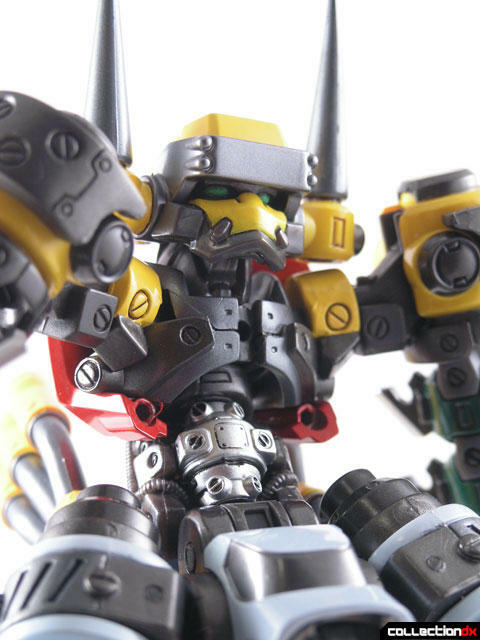 Home » 2009 » Getter 3 + Getmachine Bear Repaint Ver. 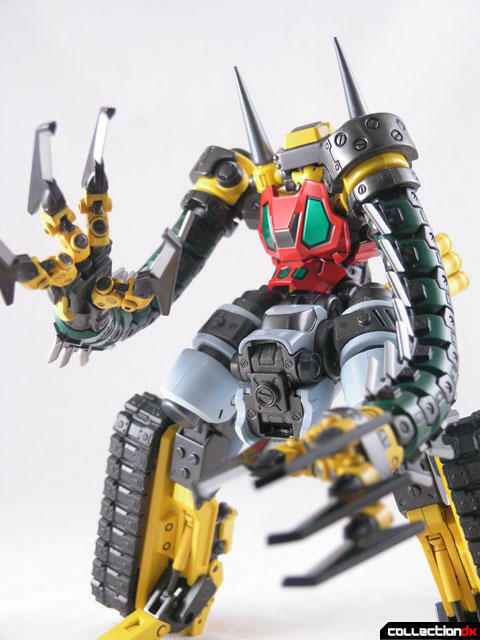 Getter 3 + Getmachine Bear Repaint Ver. 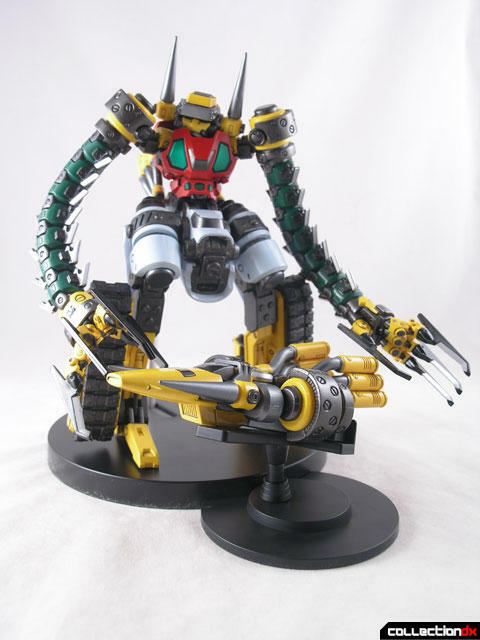 Getter 3 is the Third EX Gokin release, and arguably the best. This toy is really fantastic. Each of the design concepts put forth on the prior releases are perfected here. The toy comes packed in the same style box as the other two EX Gokin Getters. The hard cardboard box is enclosed in a slipcase, and inside is a paper covering and then the styrofoam tray. Each piece of the toy is wrapped in plastic. The toy is practically ready to go out of the box, the only thing you need to do is add the die-cast medallions and chest plate. 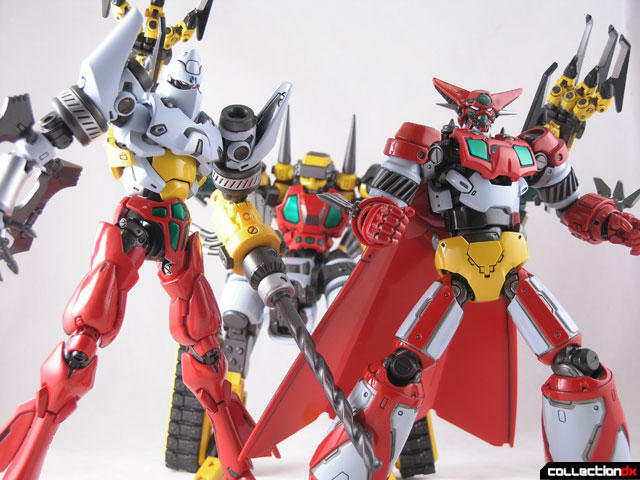 Getter 3 is a lot of fun. 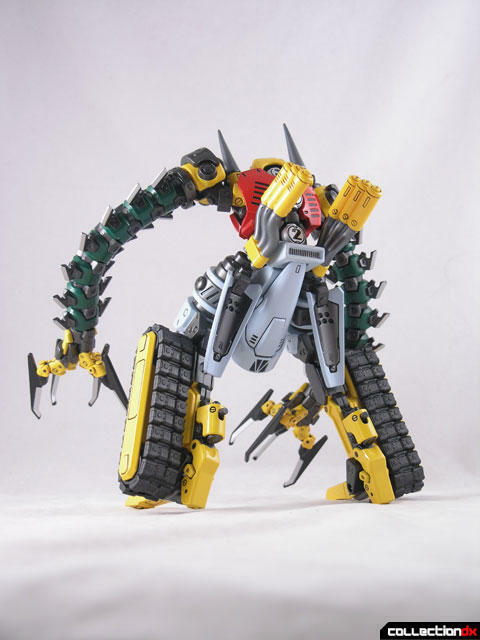 It's got bendy arms, articulated claws, removable panels, real rubber treads and it transforms into two modes. I could gush all day about this, but why don't we take each feature one at a time. 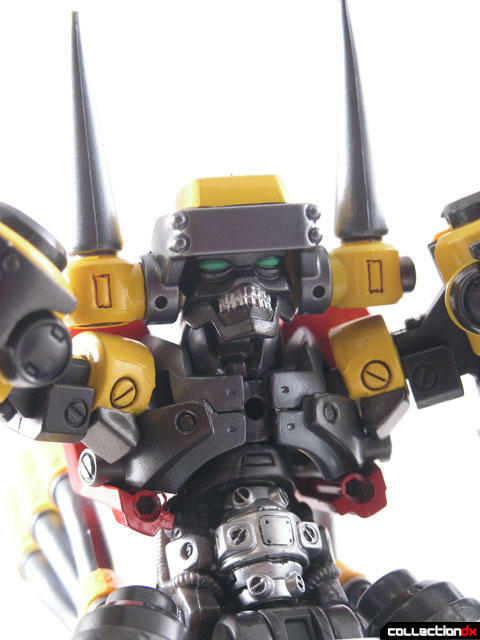 The head is not metal, sadly, but hard PVC, with a removable faceplate that reveals the skeletal face within. The horns on the are removable. 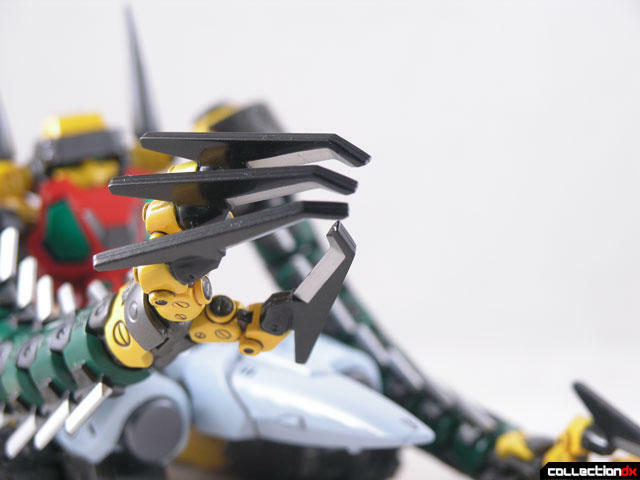 The chest features a removable diecast panel that reveals the inner workings of Getter 3, including the Getter Generator. This Generator is removable. 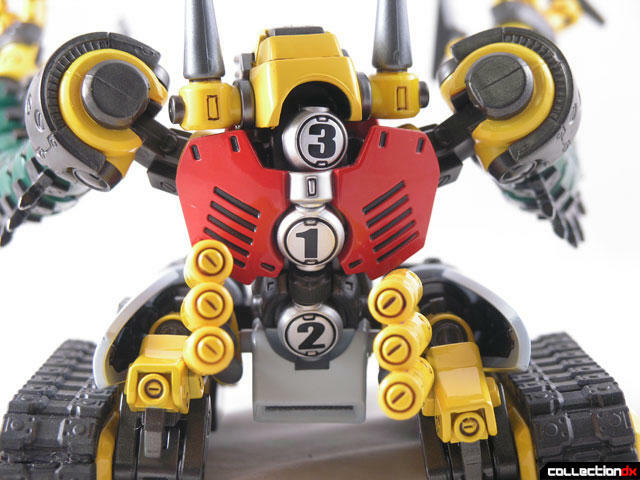 On the back of the figure are spots for three metal medallions, representing each of the getter machines. They go in the order that the get machines combine to make that particular model. Two sets of medallions are included, in English or old-style Japanese kanji. The shoulders have an excellent range of motion. 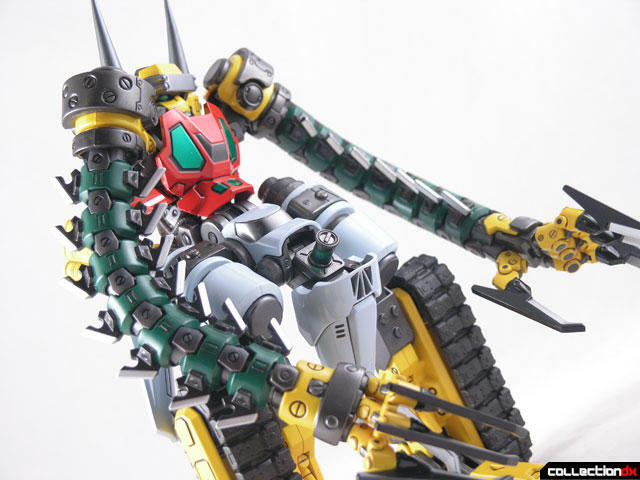 The whole shoulder assembly can swing towards the chest, and the shoulders themselves can rotate and click outwards. 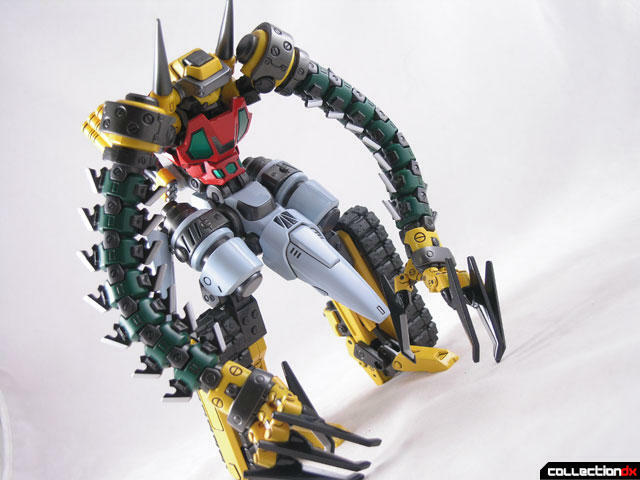 The long segmented arms are all plastic, and each segment is a separate piece. 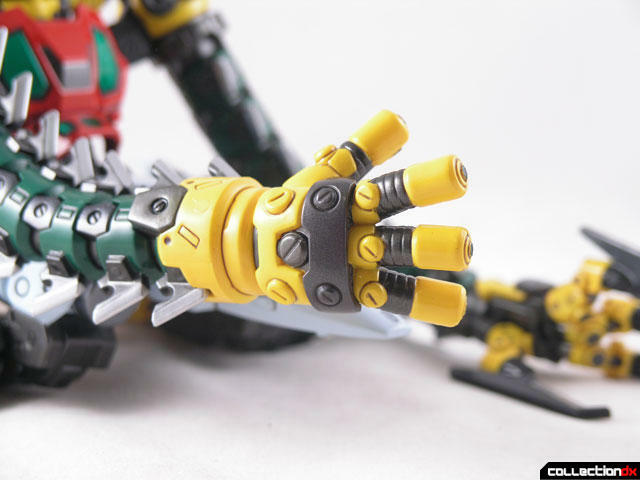 Inside the arm must be either a bendy wire or a series of joints, because the whole arm is articulate. At the end of each arm you have your choice of three interchangeable hands. 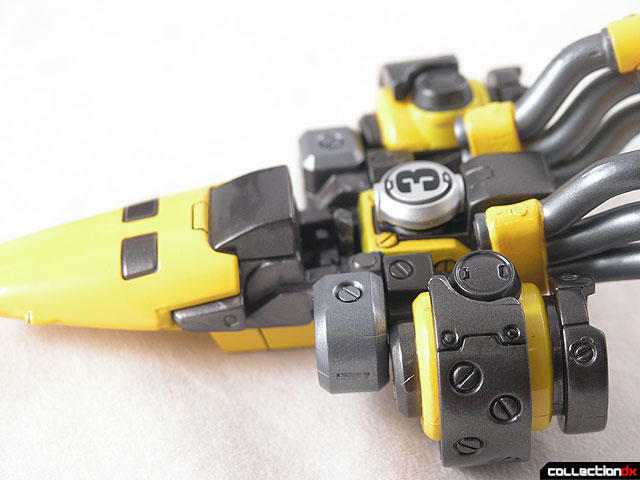 The hands that are already on the figure are the most interesting. 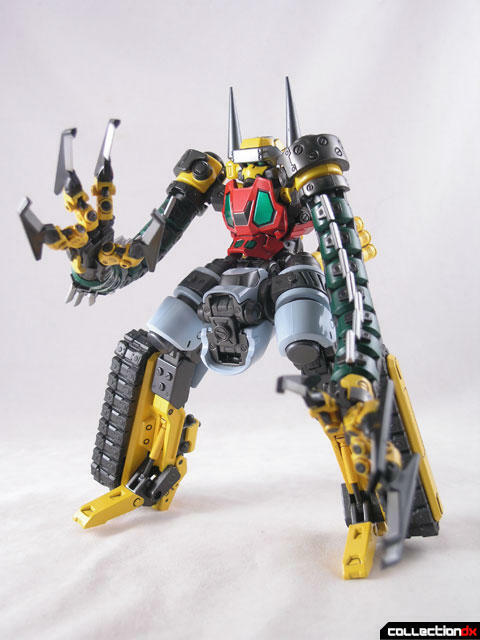 These clawed hands feature an amazing amount of articulation and detail. Each finger is articulated at the knuckle and at the hand. The other hands - the closed and open fists, are stationary. 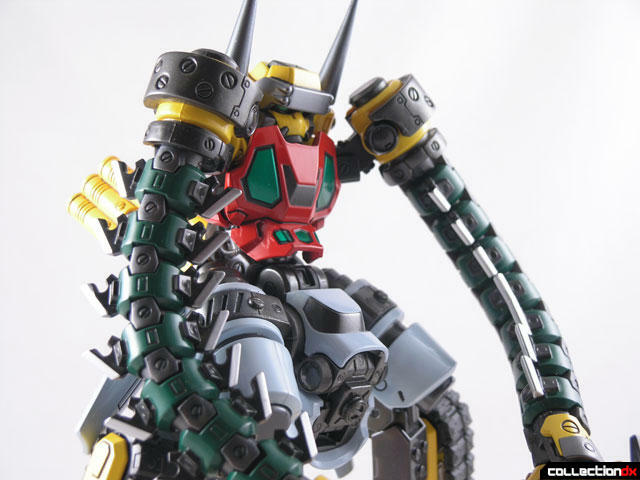 Getter 3 is half robot and half tank. 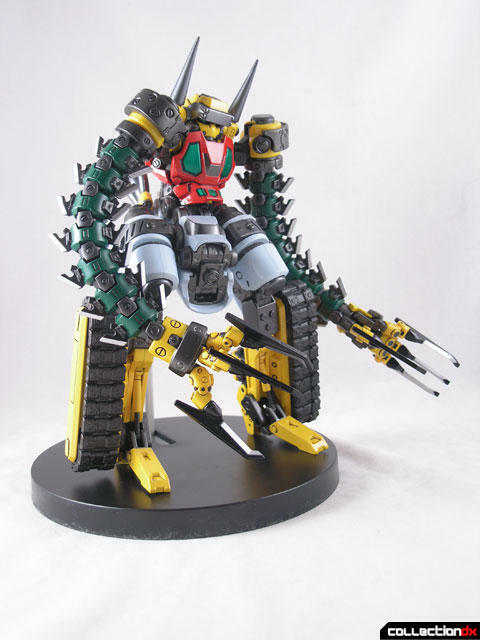 The lower half - the tank part, is amazing. The central fuselage is almost entirely diecast. Two hot-rod style exhausts protrude from the back end. On either side of the fuselage there are large, rubber, working tank treads. These treads are really great and have an old-school feel. 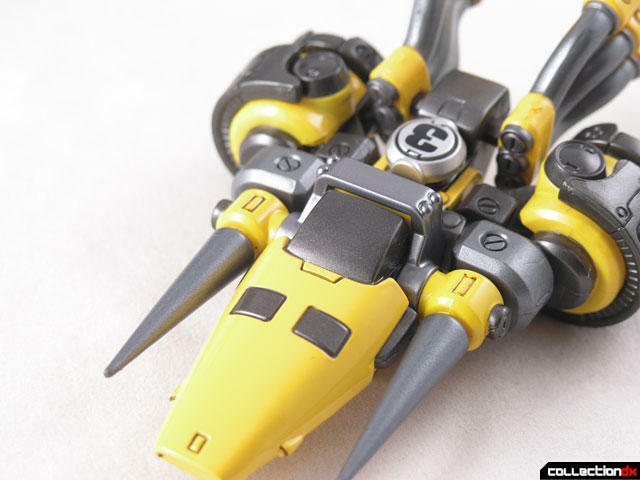 Each tank assembly is on an articulated joint. 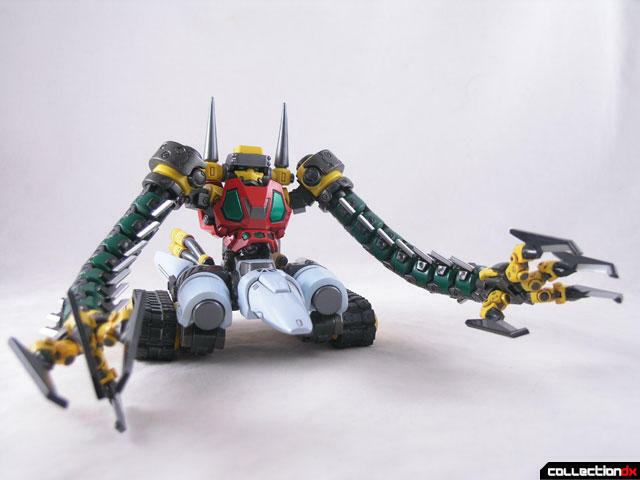 While the original Getter 3 was stuck to being a tank, this one can extend the tank treads into legs, like Getter Poseidon could. 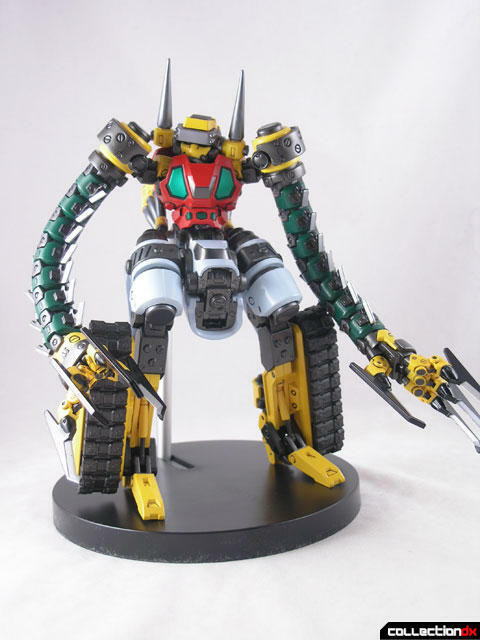 Professor Robo worked this in as a tribute to Getter Poseidon's design. Transformation is easy, but there are a few things to be aware of. To start off, you need to pull the nose of the fuselage out so it extends to reveal TWO joints. You then bend the nose under the fuselage. 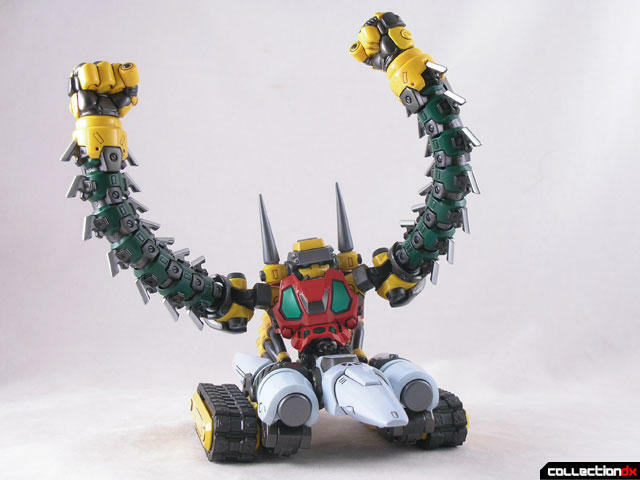 When this is done, it reveals where the tube of Getter Energy is stored. Each tank section is released by pulling a spring loaded lever on the back which unlocks the section. The side cowlings will rotate backwards and then hang down. 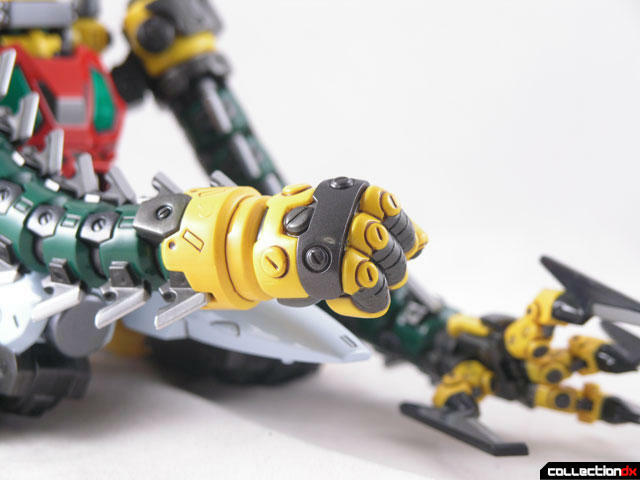 The knee joints are interesting, and the instructions don't really explain it. To get full extension on the legs, not only do you need to bend the joint, but you need to PUSH the joint backwards. Imagine instead of having pegs that fit into a hole, you now have pegs that fit into a small track. You need to slide the lower parts of the legs back in this track, but only a small amount, maybe 1/8 of an inch. From there you pull the feet down, and you will notice here a working hydraulic piston - a nice touch. The back part of the feet then lock the feet in the place. Once you are done Getter 3 stands tall and proud, albeit a little hunched. 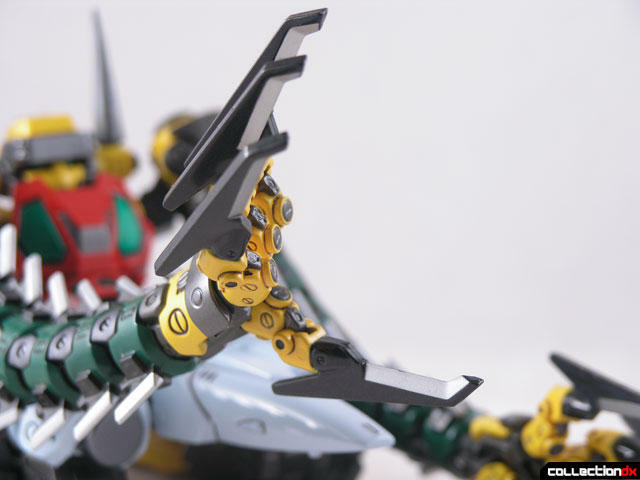 Articulation in the legs is so-so. While all the key joints are there, you can't do much with them. 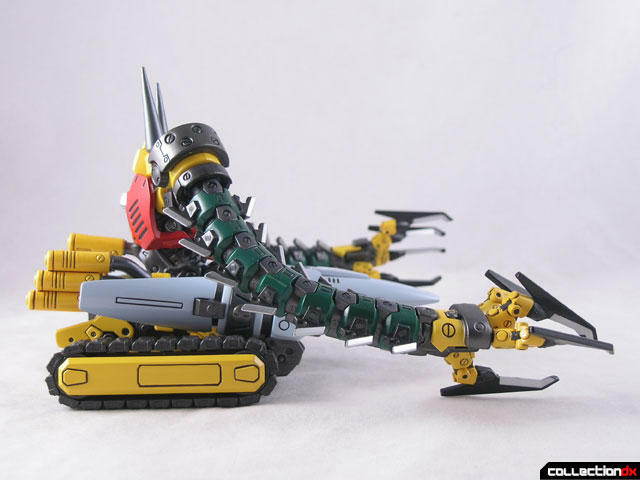 You can rotate and splay the legs, bend the knees a little, but that's about it. Since the feet lock into place, stances are limited. Still, it stands great and looks great. 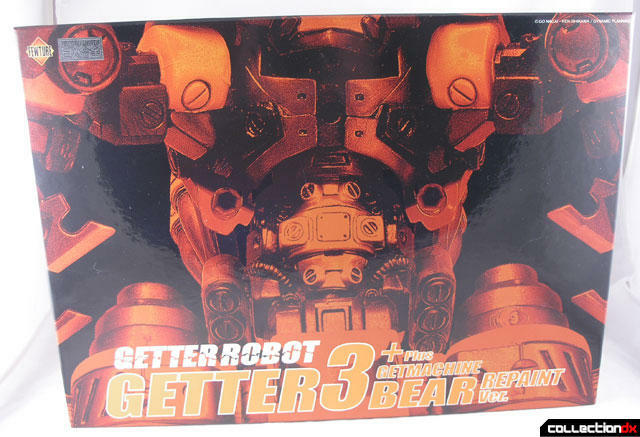 Each EX Gokin Getter comes with the vehicle that makes up the primary section, in this case its the Getmachine Bear. 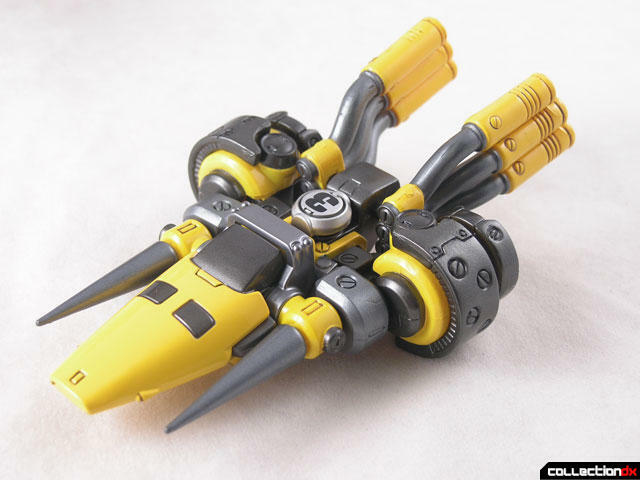 The vehicle is diecast with the engine sections being plastic. The cockpit cover is removable to reveal a pilot seat. The ship has room for one medallion. Stored on the back side of the styrofoam tray are the two stands for the figure and vehicle. 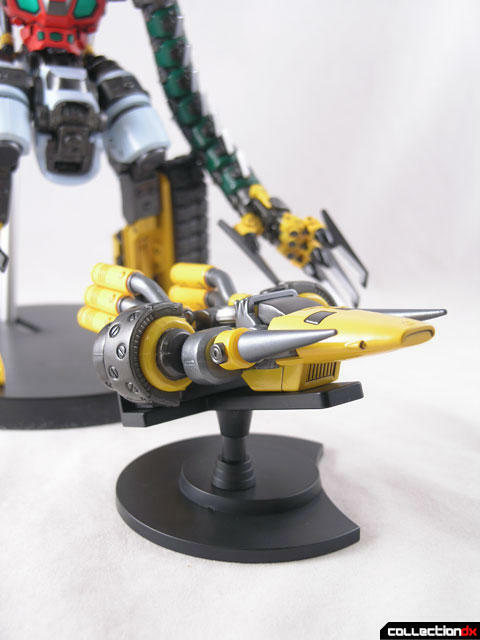 The stand for Getter 3 looks like a precision medical instrument, with metallic knobs and hinges. 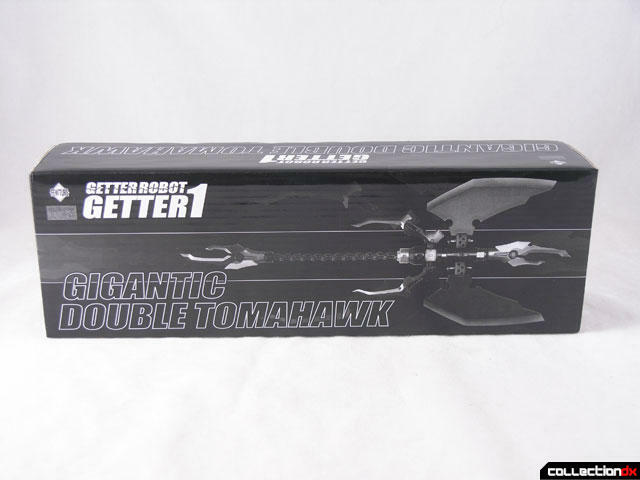 A special clip attaches Getter 3 to the stand. What's nice about this stand as opposed to the others is this stand could be adjusted by twisting knobs whereas the others needed a screwdriver. The stand for Getmachine Bear is simple, but molded precisely for this vehicle. The stand has a cut out to fit against the larger stand. You may have noticed the "repaint ver." part of the name. The majority of the differences are in the paint. 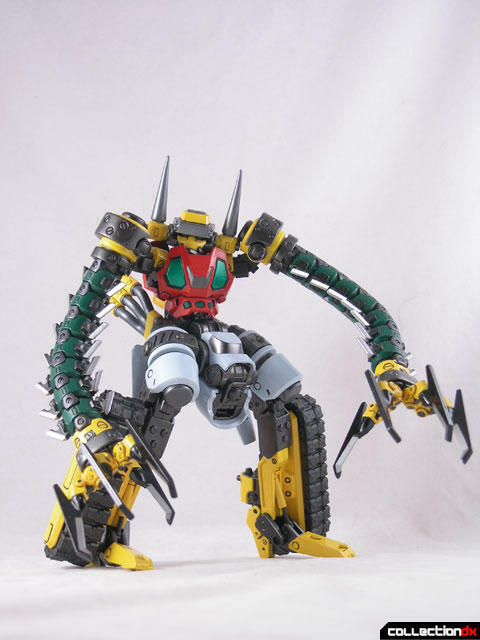 The arm sections on this version are green as opposed to grey on the original. The bluish-white paint on the tank section was more pure white on the original. Finally, the yellow paint on this version was orange on the original. Other than that, there are no differences. 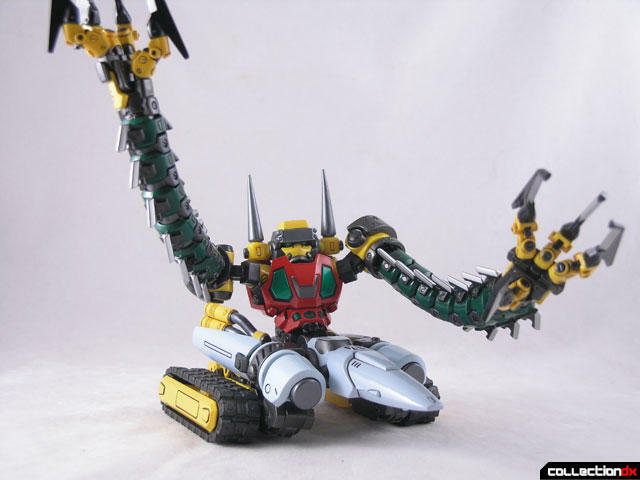 Released with this set was an additional weapon for Getter 1. This weapon was available to people who preordered the whole set of three. It will be reviewed in a separate review. Displaying all three EX Gokins next to each other is nothing short of amazing. Truly a work of art. 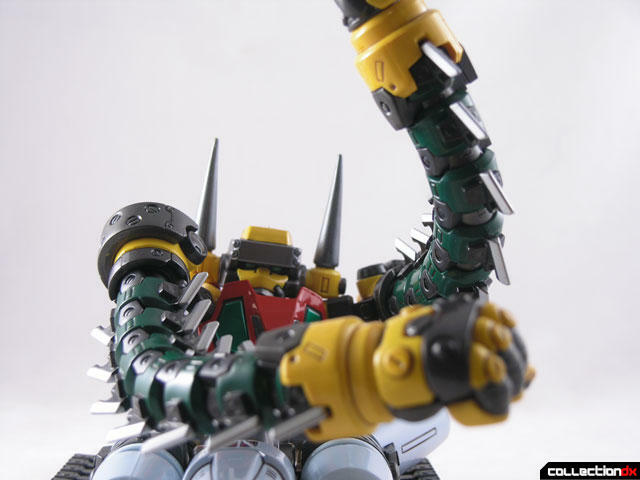 Gokin art! Yet still so old school cool. Wow. Beautiful photo review , and thanks for pointing out the cool little features and gimmicks so well. Never knew so much was going on with this, from the regular sale pics. I hate these guys! 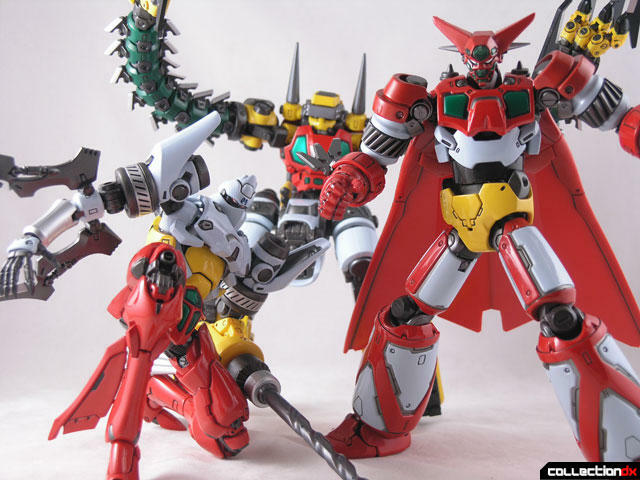 This trio is the most awesome toy set I've ever seen and it's so dam expensive... sigh. I got to say after getting this item and my impression from the review was vastly different. The quality of the material and paints are different then Getter 1. The smell of the paints are different too. Getter 3 used cheaper grade of plastic/PVC and poor paint job. 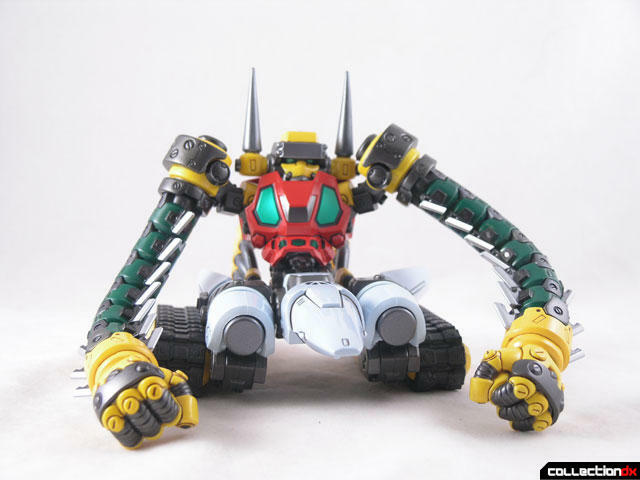 The Getmachine Bear is pretty poor comparing to Getter 1's getter machine. the gettermachine is the worst part of this item. The metal content on it is light too. 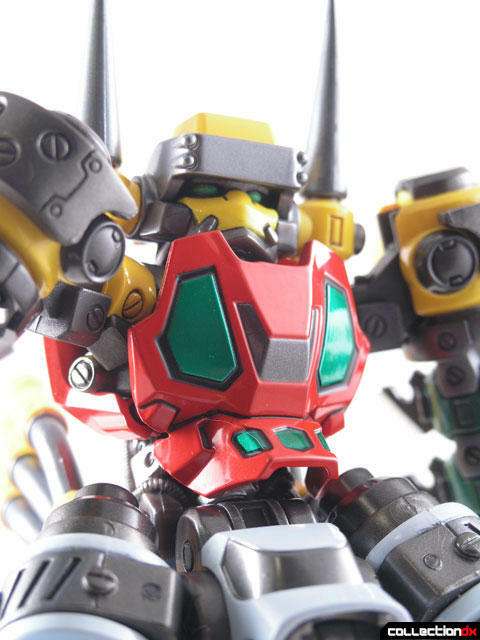 The paints on Getter 1 appears to have multiple layers with thick rich paints. 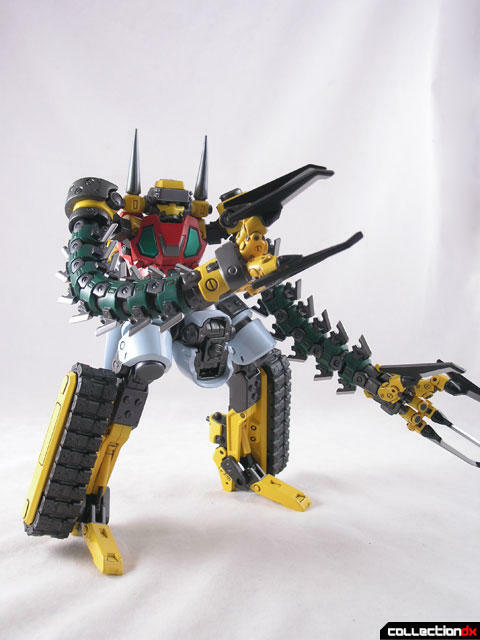 Getter 3? not so much. Metal content? on the review it said the lower body or the "white" part were madeout of metal. I got news for ya, the yellow part are metal, white part has metal only like 50%. Getter 1 lower legs were all covered with metal including the pelvis area. not this one. Original price? heck a disappointing ripped off. Howver at ANgloz sale price, i think it is reasonable.